The Rebel Sweetheart. 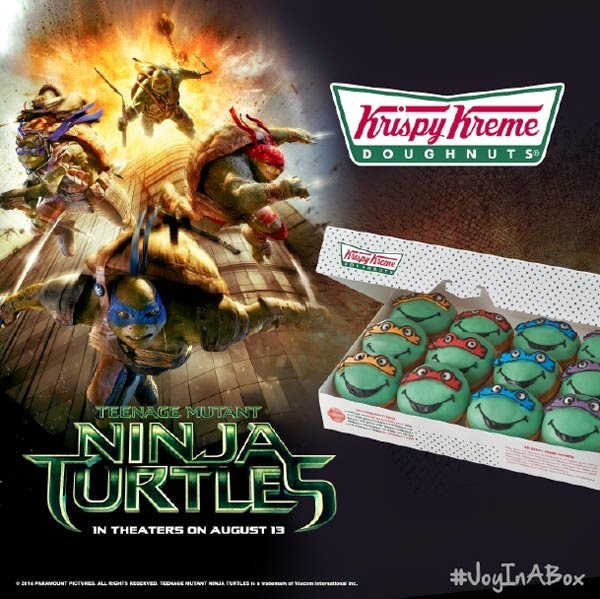 : Foodie Goodie | Krispy Kreme Teenage Mutant Ninja Turtles Donuts. 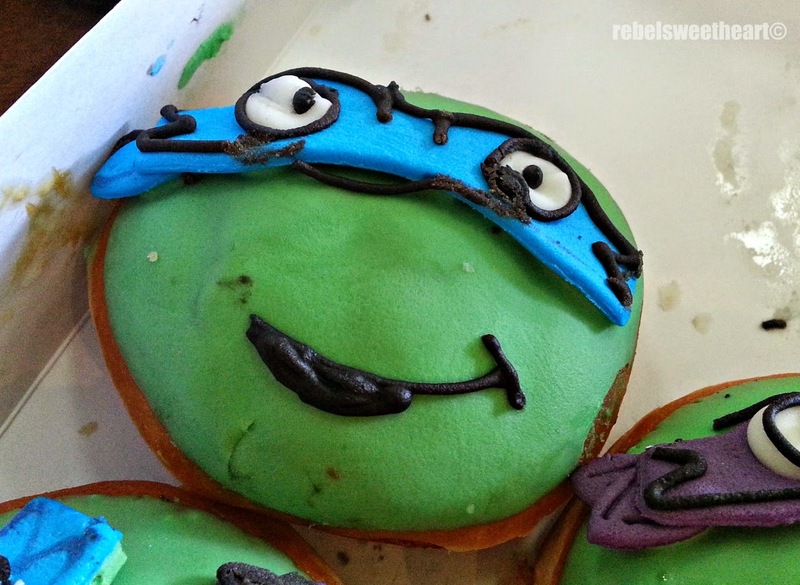 Foodie Goodie | Krispy Kreme Teenage Mutant Ninja Turtles Donuts. Now that the little man's Quarterly Exams are over, we can finally sit back, relax, set his books aside for the meantime, and just really enjoy the weekend. I promised my boy we'd go to the movies if he did well in his exams, and so far - from four of his subjects - he's kept his end of the bargain. Turtle Power sans my favorite turtle, Michaelangelo. He was sold out at KK Megamall! I loved them turtles ever since I was a child (I'm a kid of the 80's, you know), and I'm glad my son appreciates them as well. He now has a growing collection of anything 'Ninja Turtle' - from toys, to clothes, to bags, and now even donuts. Haha! Meet Leonardo. In case you didn't know, he's also the leader of the awesome foursome. That was a joke, of course. It didn't even take a day for the little man and I to finish this box of 'turtle-frosted' donuts. (Hello, calories on the hips!) Aside from the cuteness factor, I love how these donuts are not cloyingly sweet. Truth be told, they're barely sweet - which is rather surprising considering that the green frosting is actually made from white chocolate. Truly, Joy in a Box. These are so cute. 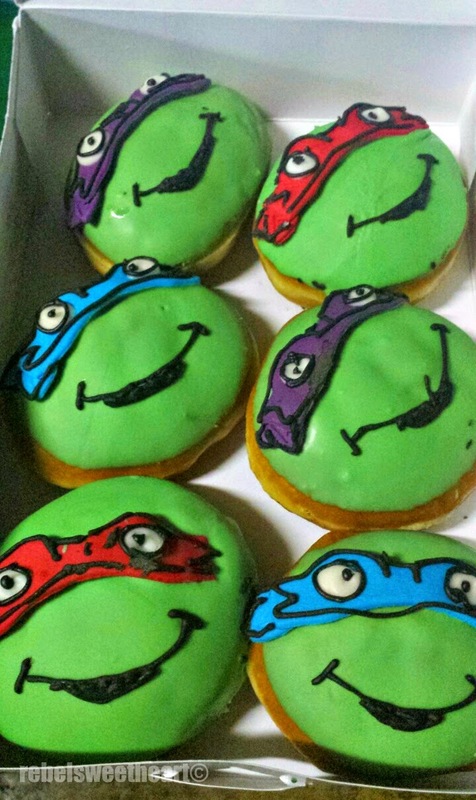 I bet my boys would love these donuts too, they like ninja turtles. Oh how fun! I'm an 80's kid too! Our son is a fan of TMNT and I'm a fan of donuts! We both win! My 3yo also loves the turtles and was excited to try it. We bought him a box but he only ate 2 and really just liked to hold it. Love that Krispy Kreme does characters though! These donuts made me reminisce my childhood days! Must visit KK for a dozen this weekend. Oh my! I'm so happy to hear I can get these for Php 45 each! Last time I remember the monsters Inc ba un? I wasn't allowed. You had to buy it by dozen. :( Sad cos I really don't like eating that much sweets. Thanks for this! I wanna get my son one! He loves Michael ANgelo! I love these they are so cute and they look really good too. I will have to check out Krispy Kreme. Thanks for sharing. This is terribly cute !! Ninja turtles, I will definitely give these a try ! OMGosh I LOVE that, those look so cool! I haven't been to a Krispy Kreme in a LONG time!